According to legend, this is the spot where young Icarus fell into the sea after flying too close to the sun. 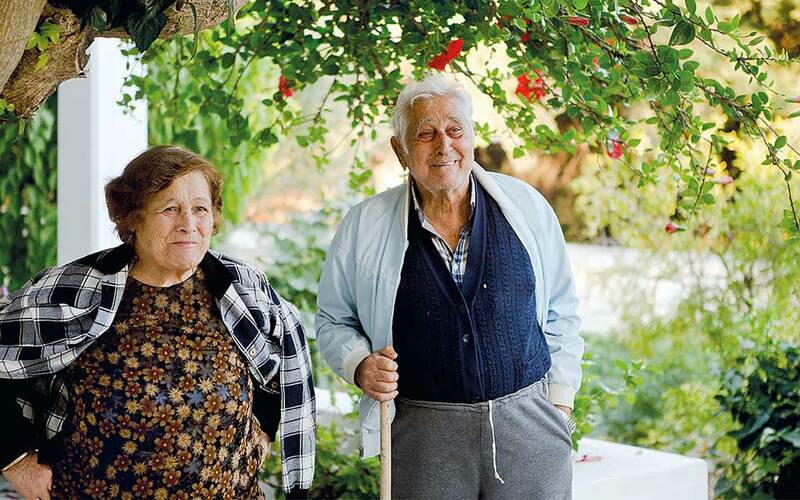 The inhabitants of the small "Blue Zone" Aegean island of Ikaria have held the keys to longevity for centuries - here are some of their secrets. I’m sitting in the home of 83-year-old writer Sosa Plakida in Stavlos, a tiny village on Ikaria (also spelled Icaria), which is a small island in the eastern Aegean with around 8,000 permanent residents. Sosa could easily pass for 70 and is sharp as a tack. In fact, most of the Ikariots I meet actually look much younger than they are. This was one of the first things I discovered when I arrived on this enchanting island – after its beautiful beaches which attract thousands of tourists every summer, and the quaint mountain villages that look like they’re posing for postcard photos. Ikariots like to meet up nightly at their local kafeneio. Such socializing is key to enjoying a long life. Ikaria is named after the mythological figure of Icarus, the impetuous young man who washed up dead on its shores after ignoring his father’s instructions not to fly too close to the sun, which melted the wax in his wings. 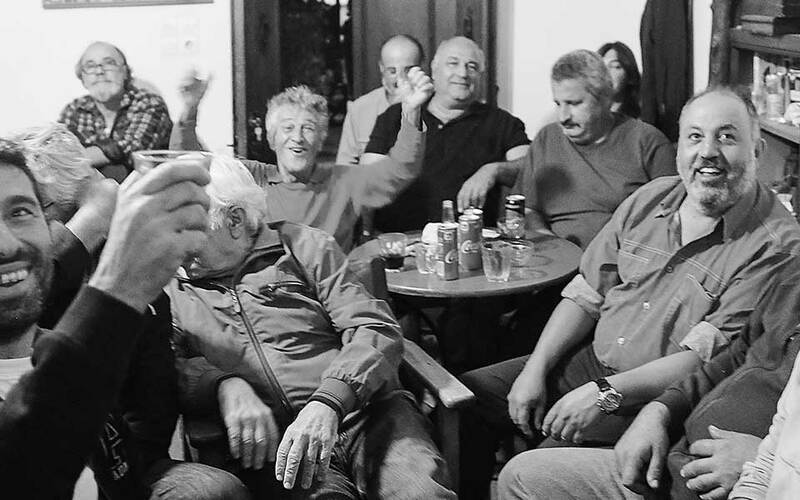 Ancient lore may associate Ikaria with youth and recklessness, but, in modern times, it has been linked to their opposites: old age and wisdom. Ikaria and another four locations (Okinawa in Japan, Sardinia in Italy, Nicoya in Costa Rica and Loma Linda in California) have been designated as Blue Zones, meaning they are parts of the world which may appear to have little in common but which share certain characteristics that result in their residents living significantly longer than average. According to studies, one in three Ikariots lives past the age of 90. And perhaps surprisingly, the longevity claims are not new. In a book published in 1678, Iosif Georgirinis, the archbishop of Samos, attributes the long life of Ikariots to the island’s air and water, to its sense of community, to their sparse diet and to their hereditary biological traits. 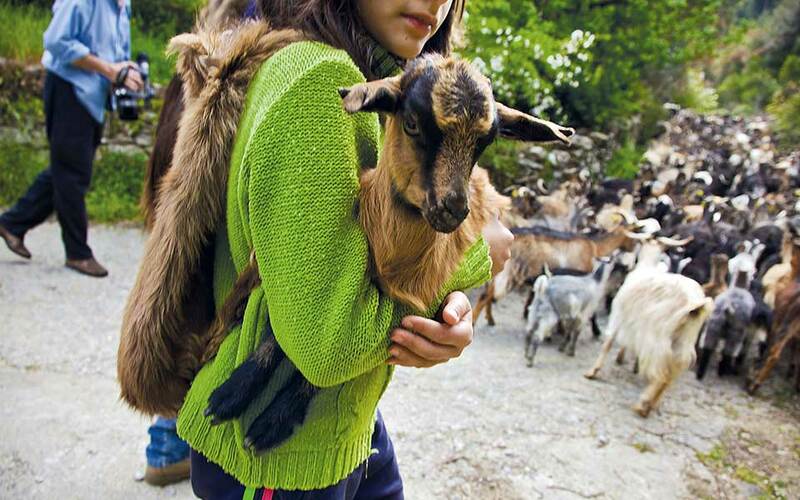 Ikaria’s younger generations learn farming and animal husbandry from their grandparents. “The way of life plays an important part,” says Christodoulos Xenakis, a neurologist-psychiatrist and a native of the island. “Ikariots have a tiring but calm routine. A laid-back attitude lets people live stress-free, and this is beneficial to their health.” Aged 83 himself and none the worse for it, he has been in charge of organizing the Ikaria Senior Regatta, a sailing competition for over-70s, for the past two years. It attracts considerable interest, particularly from locals, with 16 boats participating in the first year. The first Ikariot to sign up was 86 years old. For the tourists who flock to the island each year, Ikaria is better known for its religious festivals that go on into the wee hours, with hearty local fare, live music and lots of dancing. Visitors and locals join together in an embrace of hospitality and generosity of spirit. 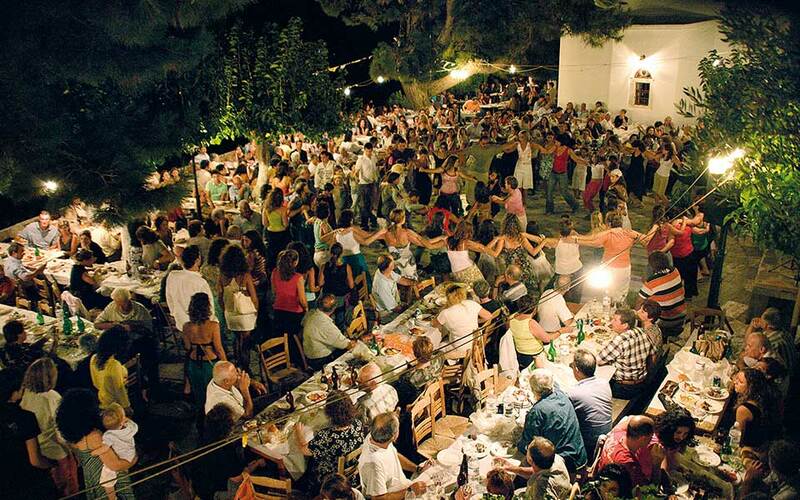 A traditional religious festival on Ikaria. Plenty of dancing, music, local food and wine keeps the crowd going till dawn. 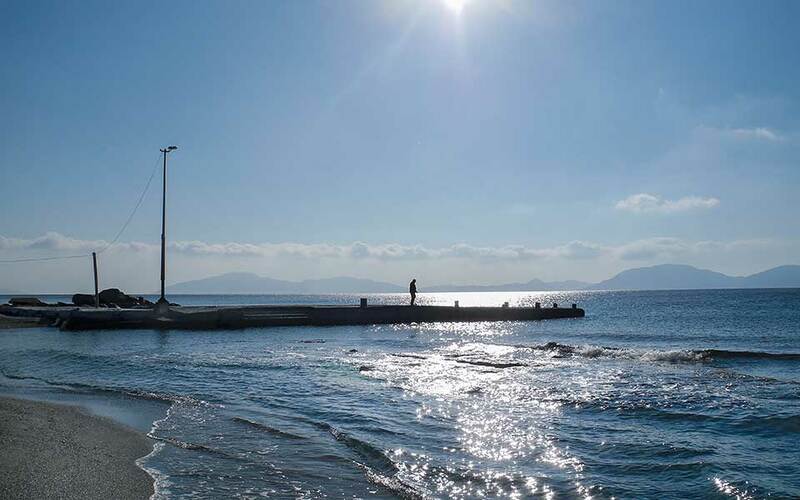 Anna Fountouli was born in 1924, yet meets her friends every afternoon and walks along the waterfront of Aghios Kyrikos as far as her legs will carry her. She welcomes us into her home and shows us some of the lovely knitting and embroidery she works on every day after lunch and before her afternoon nap (most Ikariots take a siesta). Every so often, she springs out of her chair to show us a photograph or a piece of knitting, or to let in a friend at the door. What’s her secret? “Don’t eat too much, and love where you live,” she says. Indeed, numerous studies have found that the well-balanced Mediterranean diet can be key to living a long and healthy life. For elderly Ikariots, though, it’s not a lifestyle choice. The simple fact is that most still grow their own vegetables, eat whatever nature has to offer, rely more on pulses than on meat, and consume oil made from their own olives. Take Yiannoula, for example. She’s a delightful 90-year-old who invites us into her home in the village of Faros, where she treats us to coffee, olives from her garden, rusks from her oven and kopanisti cheese she makes herself. This is all in a day’s work for Yiannoula, who has aching feet and a sore back. “I really believe we should die at 80, my dear. You can’t imagine what a hassle life is after that.” Despite this rather pessimistic outlook, she was the soul of politeness when we called the previous evening to arrange our visit, and remarkably hospitable when we arrived. Ikariots are renowned for their hospitality. Stop anywhere to ask for directions, and you’ll be invited in for a coffee or a cup of herbal tea before they even ask your name. They make their tea with local herbs (such as pennyroyal, sage, lemon beebrush and St John’s wort, which grows in abundance here) and sweeten it with honey; they call this “vrastiko” and drink it at breakfast and sometimes before bedtime. This Ikariot couple were out on their customary late afternoon stroll through local neighborhoods when we met them. The locals are well versed in the special properties of each herb. If you’re looking to relax, they’ll recommend a blend of aloe, basil, honey and wine, whereas for a cough, it will be pennyroyal; there’s even talk of something called “trivoli,” a herb similar to bindii said to have the “uplifting” qualities of Viagra. In the village of Chrysostomos, we meet a man called Petros Kratsas, a 98-year-old retired schoolteacher who, just days earlier and with the help of only his nephew, had graveled the road to his house again after part of it was damaged. Ikariots are known for such intense physical activity. The hamlets and villages were often built high in the hills so they couldn’t be spotted by the pirates who sought shelter in the natural harbors of the small neighboring island cluster of Fournoi. This means that, until recently, Ikariots had to walk long distances daily to reach their fields or animals, a habit that the older folk still maintain. Thanasis Vasilaros, 90, is another example. Even though he has officially retired as a journalist, he still writes and publishes a local paper. He walks from his village, Therma, to Faros every day to see his children and grandchildren and walks back, too, even though it’s an hour each way. 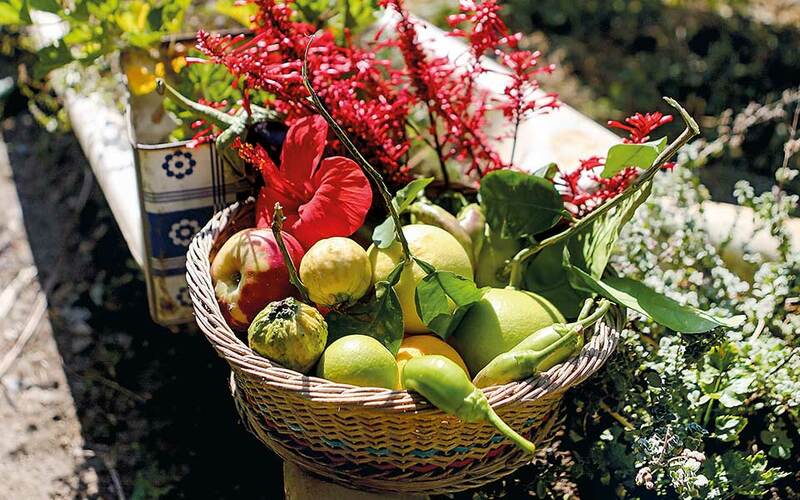 When we visit him at his home, he gives us a basket of fresh goodies from his garden: peppers, eggplants, lemons and fragrant guava, an exotic fruit that came to the island from Egypt and is today found in many gardens. With properties similar to the kiwi, it contains four times more vitamin C than oranges. All of the fruits and vegetables in the basket that 90-year-old Thanasis Vasilaros generously offered us come from the garden he tends all by himself. So, is it this lifestyle – the exercise, diet, slow pace and midday naps – that is slowing down the clock? Athens University cardiology professor Christodoulos Stefanadis and his team have been studying the longevity of Ikariots for years; they’ve published more than 20 papers in international medical journals and spoken on the subject at more than 100 conferences. Few younger Ikariots follow in their forebears’ footsteps. The tourism sector is run by the descendants of those who lived off the land, and the stress of modern-day life is becoming evident across the island. The young use cars and motorcycles to get around and modern tools to do their farm work. And while their diet is certainly healthier than most city dwellers, they also consume the usual products found in supermarkets. What effect these new habits will have on their health and lifespan is unknown. “That is an interesting study prospect,” says Stefanadis. In the meantime, we’ll try to follow the advice of a lovely old man we met at a coffee shop: eat half as much, walk twice as much, laugh three times as much and love without bounds. Faros Beach. According to studies, the subsoil and waters of Ikaria are beneficial to one’s health. The ancient Greeks knew all about the healing properties of Ikaria’s natural springs, and the ruins of the ancient bath town of Therma are there to prove it. Ikaria’s subsurface is rich in radon, an element that, according to epidemiologist Giorgos Kallivrousis, can be beneficial in controlled doses. Among other properties, it helps relieve pain caused by ailments of the muscles and skeletal system, orthopedic injuries and osteoporosis, and also helps manage skin diseases. 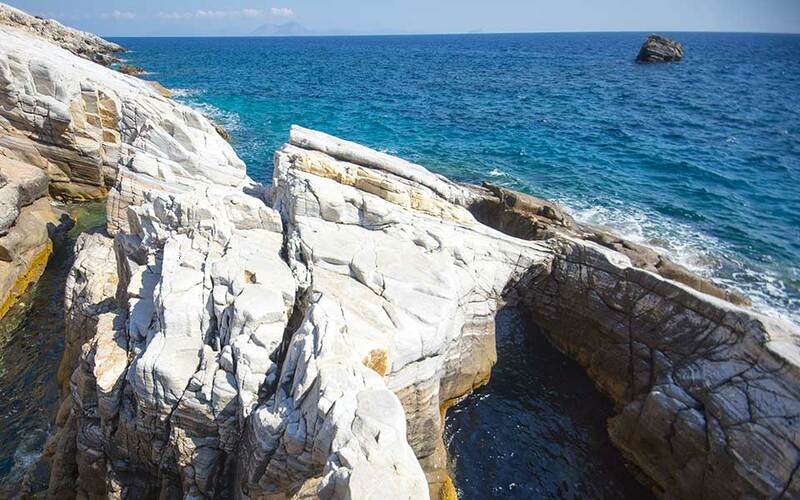 In recent years, Ikaria has been developing into a health tourism destination, with its seven municipal and open-air springs receiving many visitors each year.